This is an ongoing post in a series of posts about Middlware for Stomp users, please read parts 1, 2 and 3 of this series first before continuing below. Back in Part 2 we wrote a little system to ship metrics from nodes into Graphite via Stomp. This solved the goals of the problem then but now lets see what to do when our needs change. Graphite is like RRD where it would summarize data over time and eventually discard old data. Contrast that with OpenTSDB that never summarizes or delete data and can store billions of data points. Imagine we want to use Graphite for a short term reporting service for our data but we also need to store the data long term without losing any data. So we really want to store the data in 2 locations. Send the metric twice from every node, once to Graphite and once to OpenTSDB. Write a software router that receives metrics on one queue and then route the metric to 2 other queues in the middleware. The first option is an obvious bad idea and should just be avoided – this would be the worst case scenario for data collection at scale. The 3rd seems like the natural choice here but first we need to understand the facilities the middleware provides. Todays article will explore what ActiveMQ can do for you in this regard. The 2nd seems an odd fit but as you’ll see below the capabilities for internal routing at the middleware layer isn’t all that exciting, useful in some cases but I think most projects will reach for some kind of message router in code sooner or later. If you think back to part 2 you’ll remember we have a publisher that publishes data into a queue and any number of consumers that consumes the queue. The queue will load balance the messages for us thus helping us scale. In order to also create OpenTSDB data we essentially need to double up the consumer side into 2 groups. Ideally each set of consumers will be scalable horizontally and the sets of consumers should both get a copy of all the data – in other words we need 2 queues with all the data in it, one for Graphite and one for OpenTSDB. You will also remember that Topics have the behavior of duplicating data they receive to all consumers of the topics. So really what we want is to attach 2 queues to a single topic. This way the topic will duplicate the data and the queues will be used for the scalable consumption of the data. 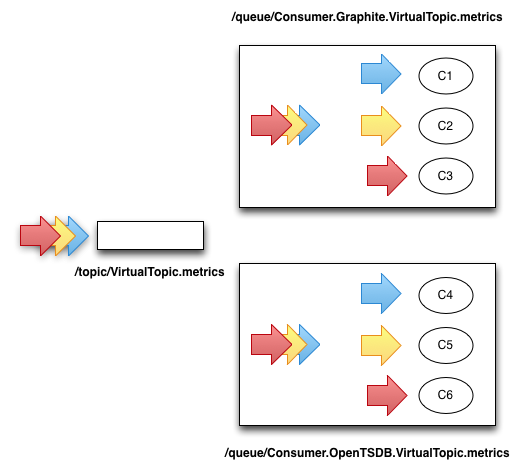 ActiveMQ provides a feature called Virtual Topics that solves this exact problem by convention. You publish messages to a predictably named topic and then you can create any number of queues that will all get a copy of that message. Create as many of the consumer queues as you want, changing Graphite for some unique name and each of the resulting queues will behave like a normal queue with all the load balancing, storage and other queue like behaviors but all the queues will get a copy of all the data. You can customize the name pattern of these queues by changing the ActiveMQ configuration files. I really like this approach to solving the problem vs approaches found in other brokers since this is all done by convention and you do not need to change your code to set up a bunch of internal structures that describes the routing topology. I consider routing topology that is living in code of the consumers to be a form of hard coding. Using this approach all I need to do is make sure the names of the destinations to publish to and consume from is configurable strings. Our Graphite consumer would not need to change other than the name of the queue it should read and ditto for the producer. If we find that we simply could not change the code for the consumers/producer or if it just was not a configurable setting you can still achieve this behavior by using something called a Composite Destinations in ActiveMQ that could describe this behavior purely in the config file with any arbitrarily named queues and topics. Imagine we wish to give each one of our thousands of servers a unique destination on the middleware so that we can send machines a command directly. You could simple create queues like /queue/nodes.web1.example.com and keep creating queues per server. The problem with this approach is that internally to ActiveMQ each queue is a thread. So you’d be creating thousands of threads – not ideal. We are publishing a message with the text service restart httpd to a queue and we are setting a fqdn header. Now if every server in our estate subscribed to this one queue with the knowledge you have at this point of Queues this would have the effect of sending this restart request to some random one of our servers, not ideal! The selector header sets the logic to apply to every message which will help decide if you get the message on your subscription or not. The selector language is defined using SQL 92 language and you can generally apply logic to any header in the message. This way we set up a queue for all our servers without the overhead of 1000s of threads. The choice for when to use a queue like this and when to use a traditional queue comes down to weighing up the overhead of validating all the SQL statements vs creating all the threads. There are also some side effects if you have a cluster of brokers – the queue traffic gets duplicated to all cluster brokers where with traditional queues the traffic only gets send to a broker if that broker actually has any subscribers interested in this data. So you need to carefully consider the implications and do some tests with your work load, message sizes, message frequencies, amount of consumers etc. There is a 3rd option that combines these 2 techniques. You’d create queues sourcing from the topic based on JMS Selectors deciding what data hits what queue. You would set up this arrangement in the ActiveMQ config file. This, as far as I am aware, covers all the major areas internal to ActiveMQ that you can use to apply some routing and duplication of messages. These methods are useful and solves some problems but as I pointed out it’s not really that flexible. In a later part of this series I will look into software routers from software like Apache Camel and how to write your own. From a technology choices point of view future self is now thanking past self for building the initial metrics system using MOM since rather than go back to the drawing board when our needs changed we were able to solve our problems by virtue of the fact that we built it on a flexible foundation using well known patterns and without changing much if any actual code. This series continue in part 5.